public and perpetuate the cover-up. photographic education whatsoever. He has never worked with photography. Bob Grodin has never been a photographic interpreter in his life. Takes both hands off wheel. There's a good possibility Groden's lies were televised and recorded. I believe he testified twice. WATCH GREER PLACE THE GUN IN HIS LEFT HAND. 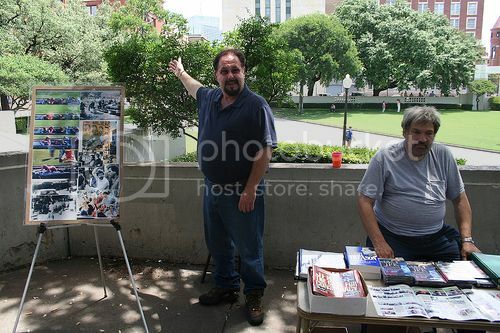 The washed up conspiracy theorist on the right is Groden, likely the 45th aniverssary on Elm street. Couldn't you post a SLOW version of that NIX GIF? It would help a lot. Thanks.